As a courtesy, Newport Internet offers basic instructions for setting up a few of the more widely used third-party email programs such as MS Outlook, Outlook Express Windows Mail, Eudora, Thunderbird and Mac Mail. If you wish to learn how to access your email via Webmail please go here. We are not responsible for the functions or reliability of such products. Extended telephone technical support may be charged to your account if an email problem lies with your application settings and not our system. Please use these pages to ascertain your settings are correct. If your settings appear to be correct please read our email FAQ (Frequently Asked Questions) to determine if there is another issue that might be causing the problem. Also, some service providers have taken to blocking port 25 for outgoing mail due to spam traffickers abusing outgoing servers. 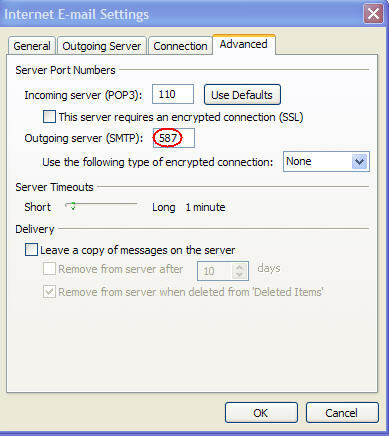 IF port 25 doesn't appear to be working for you alter your outgoing mail servers port to 587 as shown in the image below. Click on the name of the program below that you wish to setup, for more detailed instructions for setting up your account.